The Reeves family has been growing crops in the Baldwinsville area for more than a century. With the fourth generation of Reeves ownership and the fifth generation now contributing to its success Reeves Farms focuses on high quality berries and vegetables and remains a good steward of the land. Through the use of Integrated Pest Management, reduced tillage, expanded cover crops and crop rotation, organic production and other sustainable farming practices, the health of our soils and water resources will be insured for generations to come. When Arthur Thomas Reeves arrived from Draycott, England in 1890 at the age of 18, he worked on his aunt and uncle's farm just north of Jacksonville, New York. At the end of 1898, Arthur and his wife Mary purchased their own farm on the West Road from Mud Lake, which later became known as 1100 Reeves Road, the address of Reeves Farms current operations. Arthur and Mary had eight children and grew crops and raised livestock on Reeves Road through the first half of the 20th century. Arthur and Mary's oldest son, Edward Thomas Reeves, and his wife Flossie began farming further west on Reeves Road in the mid-1920's, raising crops and milking cows. Edward and Flossie had four children and continued farming through the mid-1960's. Edward and Flossie's oldest son, Cecil Edward Reeves, grew up raising crops and milking cows and after a stint in the Navy during World War II returned with his wife Dorothy to farm with his father. They worked together for only one year when Cecil decided to try to grow crops on his own and vowed never to milk another cow. For the next several years, Cecil and Dorothy leased land, rented housing and raised cash crops and children. In 1951, Cecil and Dorothy purchased Arthur's farm at 1100 Reeves Road and moved into the family homestead. They continued to grow vegetables and grain, and eventually have nine children who all worked the farm through the 1970's. In the mid-1960's, Cecil and Dorothy also purchased Edward and Flossie's farm on Reeves Road as they continued to help out in their retirement. Through these years, the farm expanded by purchasing some neighboring farms and continued to expand in fresh market vegetables, berries and grain. Cecil and Dorothy retired in 1990. 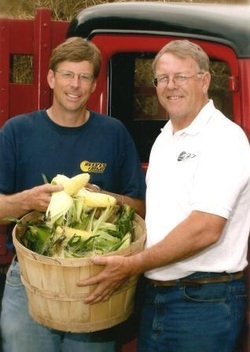 Sons Bruce, Mark and Brian formed a partnership to purchase the farm from their parents and continue growing fresh market vegetables and berries. In 1992, Bruce left the partnership and in 1995 another brother, Andy, returned to work with Mark and Brian. Today two of Mark's children, Nolan and Karin are also involved with the management of the farm. Reeves Farms encompasses over 1000 acres of tillable land and employs a seasonal workforce of of 50 -60 people.